Hazardous conditions can strike at any time, whether you are miles out backpacking or camping or sitting on your sofa at home. A smart precaution to take to stay safe when disaster strikes is to have the best emergency radio on hand. Emergency radios are most useful when the power goes out and you don’t have access to your other gadgets. Some of our readers might have used an emergency radio for a long time, and are in the process of replacing it. Obviously it is difficult to do so without knowing anything about the currently available models.we’re here to help, so don’t be too scared you know almost nothing about the current technology. We did our best to select some of the best products out there and to present them in an unbiased manner. What’s more, we also present you with the features most sought after as well. This article is meant to help anyone who is thinking about their safety during an extreme situation. Since not products are created equally, it is imperative to know some of their most common characteristics. These set apart the items that are really of use to you, from the rest. Many radios receive both AM and FM radio waves. AM can be transmitted over longer distances than FM radio but the quality of AM sound is usually not as good as FM radio. FM has better sound quality than AM radio because it has a higher bandwidth. The main downside to FM is that physical barriers on the landscape can interfere with broadcasting quality. This is an issue in remote areas. Most folks would use a reception amplifier to overcome the obstacles. In addition to the standard AM and FM radio waves, many emergency radios are able to receive NOAA weather radio broadcasts. NOAA stands for the National Oceanic and Atmospheric Administration. NOAA Weather Radio is a network of broadcasts from weather stations around the United States including the coasts, that reaches 95% of the Americans. NOAA broadcasts 24 hours a day and contains information about weather warnings, watches, observations, and forecasts, as well as additional hazard and public safety information like Amber alerts and natural and environmental emergencies. Newer model radios are compatible with the S.A.M.E. (or Specific Area Message Encoding) technology. The user can set the areas codes for which they want to receive alerts. Most people are interested in hearing the warnings related to their county, and not necessarily the whole state or country. Some radio models have lights of different colors to set apart the kinds of alerts. This is a helpful feature for those with a hearing handicap. The visually impaired can also find appropriate radios to warn them of danger. Many of the radios reviewed here are equipped with more than one way to charge the battery. The solutions include replaceable batteries, solar exposure, and hand cranking, along a power cord. 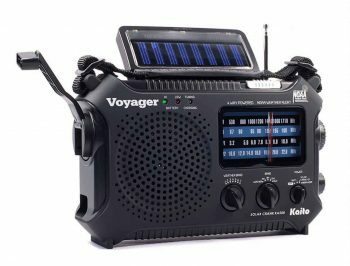 This feature is important not only during an emergency situation, but also one to consider when taking the radio along while camping or backpacking. 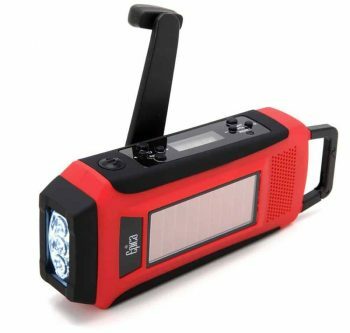 You’ll see from our selection that emergency radios can have a LED flashlight. This is not something everyone wants, but it should be considered as an extra precaution. Next is a list of various options for weather radios that are on the market today to help you choose the one that is best for you. Let’s see at some of the best brands and models of emergency radios out there, you’ll surely find something you like, even if it’s not in our selection. 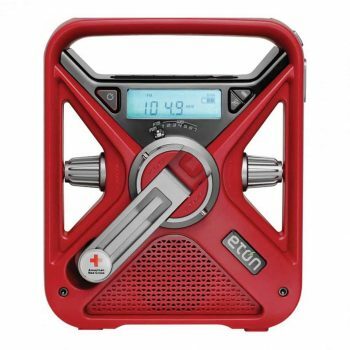 Description: The American Red Cross FRX3 Radio is a true emergency radio. It receives AM/FM radio waves as well as all seven NOAA and Environment Canada weather bands. The device also includes a flashlight with a LED and a red LED flashing emergency beacon. The battery of this radio can easily be charged with solar energy. Using the hand turbine for about 1 minutes generates energy for some 20 minutes of use. The solar panels are framed by a glow in the dark material, quite useful to locate the machine at night. One major disappointment for many users is the difficulty to turn the machine off once it is on. Disabling the alarms and placing a small plastic foil between the battery and the metal contact can do the trick. While it’s not really the best solution, you can charge your phone with this radio, enough to send an emergency message. You also have the possibility of connecting other devices with the jack in plug. Related: No matter what emergency radio you use, you might need a stronger signal. The ANTOP Reception Amplifier could be the solution with its 360° Omni directional Reception and excellent antenna effectiveness. Description: The Epica Emergency Digital Radio is useful in outdoor or power outage situations because there are multiple ways to charge it. You can plug the radio into a power source for charging, use solar power or use the hand crank. Furthermore, you also have a flashlight should the emergency situation happen at night. One minute of hand cranking will generate enough power to run the radio for about twenty minutes. It has an LCD display with a backlight for nighttime radio tuning. You can also charge your phone by connecting it to the device, but you’d probably be more successful if you did this while the radio stays in the sun for an extended period of time. It is relatively lightweight and small enough to fit into a larger pocket or a backpack. It also has a handle for attaching to said backpack or belt loop. The signal is poor even with the antenna out, but this can easily be fixed with another antenna touching it. Related: Depending on the emergency situation you’ll be in, you might want to make sure you’ll always be warm enough. The Kangaroo Emergency Thermal Blankets come in packs of 20 and could prove very useful. 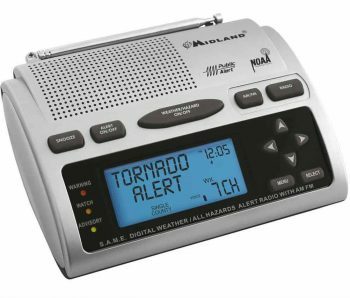 Description: The Midland WR300 Weather Radio uses S.A.M.E. technology to receive weather alerts. This machine can be programmed with up to 23 different locations. You can also add, remove, or mute alerts depending on when you want to hear them. While it includes AM/FM tuning, it will automatically broadcast any weather alerts, even while you’re listening to your favorite rock music station. The radio will sound an alarm before broadcasting the weather at night. You can have a siren like alarm, a voice one, or a visual one with the help of a LED. Speaking of the alarm, you can use this device as a morning wake up alarm and you can have your favorite station playing. This radio includes an AC power adapter and it can also be powered with four AA batteries, these are not included. You can also attach an antenna if your area is so remote you get poor signal. Related: To be in a situation where you must call for help is not something we want for our readers, but you could always need to be prepared. The Freedom TALK 2-Way Voice Alert DECT is a small device that will allow to call someone in case of an emergency. 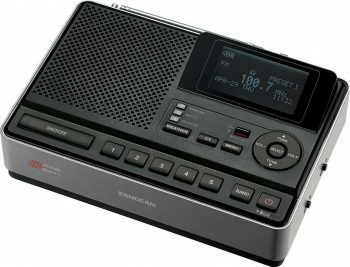 Description: The Sangean CL-100 Radio employs S.A.M.E. technology, this allowing you to set multiple locations to receive alerts for. You can store about 25 different county codes for alerts and you can save the latest 20 messages in the radio memory. This product also broadcasts NOAA reports on severe weather warnings, civil emergencies, and other hazard alerts. One nice feature about this radio is that it has a scan function to find the strongest AM/FM radio signals. There are 5 presets each for these bands. If you want to listen to your own music, just use the 3.5 mm stereo jack in. There is an LCD screen and you can use specific buttons to scroll through the past alerts, to make sure you didn’t miss anything important. Visually or hearing impaired people can connect special devices that will help them interpret the alerts and messages. Related: If this item is not really what you hoped for, maybe similar looking C Crane CC Skywave will leave a different impression. 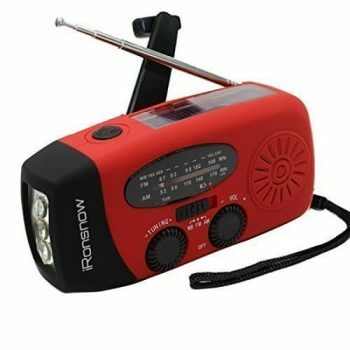 Description: The Reecom R-1630 Radio is yet another emergency radio that uses S.A.M.E. technology for programming alerts. It can store 26 county frequencies and will broadcast alerts for more than 76 different types of emergencies, including Amber Alerts, terrorist attacks, severe weather conditions, as well hazardous material spills. You can also program how loud you want the alarm to be considering the maximum is 90 decibels. It takes 4 AA batteries, which are not included, to run during power outages. Sadly, there are no other recharging options other than the power cord. 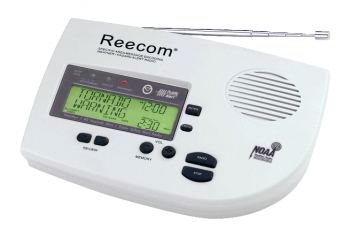 In addition to the sound alarm, the Reecom uses flashing LED lights to indicate the severity of the alerts. Another unique feature of the Reecom is that it uses an automatic countdown to the expiration time of the alert given by NOAA. The screen on the Reecom is green and can be viewed from all angles. It includes alarm clocks and a digital calendar. You can disable certain types of alerts but they will still show on the display, there just won’t be an alarm ringing. Related: Since emergency situations usually mean no electricity, so it would be best to be prepared with a reliable charger for some of your gadgets. Check out the RayHom Portable 12000mAh Power Bank. Description: There are many people out there who prefer buying multifunctional items, and this Kaito KA500 Radio is one of them. Before using it the first time, one needs to charge it for at least 6 hours, according to the instructions. To do this, the battery must be set correctly and the cover properly closed, otherwise it will mess the system up. Speaking of charging the battery, you have several options to do so. They including exposing the machine to the sun, using the power cord, and cranking it. If your cellphone’s battery needs recharging, you can use this radio however don’t expect miracles. The radio features 7 preset NOAA stations as well as AM, FM and extra 2 SW receivers. Should you be left without any light, use this product as a flashlight as it has a strong one with a LED. The red LED is for extreme emergencies, therefore quite useful as well. Related: If you’re really scared of the dark and a flashlight is more important to you, then the Kaito KA503 might be the right product for you. It also has an AM/FM radio receiver. Description: The iRonsnow is the lightest of the weather radios we have reviewed here. At less than half a pound, it’s portable and lightweight to take along on trips. It also includes a wrist lanyard to ease carrying when you are trying to stay updated on weather alerts. You have several options to charge this device including hand cranking, USB or solar power. The solar panels are placed on top of the device so you should be careful with that part. This radio uses rechargeable batteries that you’re not supposed to replace. This product features a flashlight as well that uses 3 powerful enough LEDs. While it might be better to use a different charging source for your cell phone, do know you can achieve a small battery charge from this product. Because of its small size and consequently smaller battery capacity, the iRonsnow IS-088 Dynamo Radio is best used as an emergency radio rather than one for recreation. Related: The Ambient Weather WR-099 has a very similar appearance and functions, therefore it can act as an alternative. 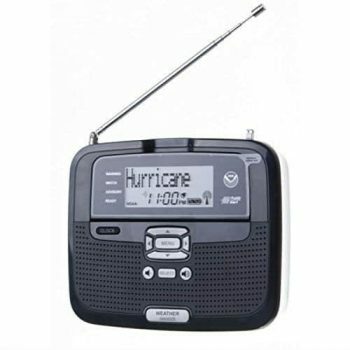 Description: The Radio Shack With Hazard Alert is quite inexpensive option we have included in this article, but it has the important features you need in a weather radio. You can program the areas that matter to you into the S.A.M.E. feature and includes a local area locator feature to make this easier. There are separate alert volumes for day and night and it includes different colored LED lights to help you easily distinguish between types of alerts: warnings, watches or advisories. You can mute all the alerts except the ones related to tornadoes. It also has a feature that lets you know if you missed an alert, which can be important if you stepped outside or didn’t hear the radio. One thing to be aware of is that Radio Shack confirmed that these weather radios had a high failure rate after several months of use, so be sure to stay aware of how well your device is working. Related products: If you want a different product with similar features, try the Midland WR100. While it has been discontinued, you can still purchase it. This is where our presentation ends. As you can see there are many types of emergency radios available. They come in different sizes and employ a variety of broadcast technologies. We hope that our article help you better understand all the features of such a product and will be able to purchase the item meeting your needs the most. It is our hope that you won’t find yourself in a situation when this type of radio is needed, but that you will be prepared for it regardless. If you just need to replace your old emergency radio, now you know what the latest models have to offer, even though getting used to them will take a while. So tell us, when was the last time you had to use an emergency radio and what happened? Or have you ever owned an older type? Do you think we missed a better model from our reviews?